If you like to solve problems, see patterns, and aspire an in-demand career, mathematics is for you. 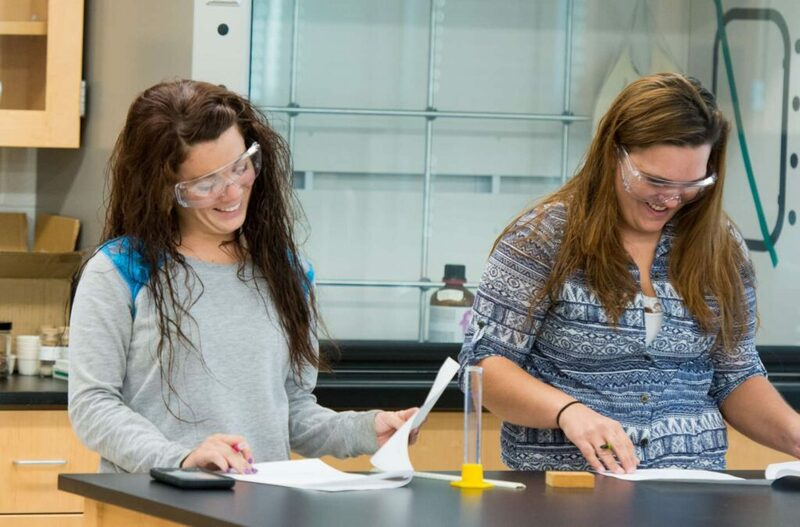 Mathematics is an exciting and challenging experience at SMWC. It is an experience rooted in the College’s liberal arts tradition. A math major is involved in communication and problem-solving using up-to-date technologies. Since classes are small, it is easy to ask questions and to form study groups to learn math in an open and supportive environment. Professors are highly qualified — often with expertise in related fields of education and the sciences — and ready to assist you with any help you may need. In addition to Woods Core courses and electives, the Mathematics major requires 37 credit hours of mathematics-focused coursework. 37 credit hours required; All courses listed. Derivatives and integrals of functions of a single variable. Concepts and applications are studied from graphical, numerical and symbolic points of view. Graphing technology and symbolic algebra software are used. Writing assignments and projects are included. Every year. Prerequisite: four years of college preparatory mathematics, MA 113, MA 117 or MA 120. Derivatives and integrals of functions of a single variable. Concepts and applications are studied from graphical, numerical and symbolic points of view. Graphing technology and symbolic algebra software are used. Writing assignments and projects are included. Every year. Prerequisite: MA 121. An introduction to the mathematics and methods of discrete quantities: number systems, sets and logic, combinatorics, algorithm analysis, Boolean algebra and circuits and graph theory. Applications from computer science. Every other year. Prerequisite: MA 117. A first course in mathematical modeling, i.e., the application of mathematical methods to real-world problem solving. Includes computer simulations. Topics selected from the natural or social sciences. Prerequisite: For 2 credit hour class, MA 117 or equivalent; for 3 credit hour class, MA 121. Matrices, vector spaces and linear transformations with applications in business and the physical and social sciences. Utilizes appropriate technology. Prerequisite: MA 121. Functions of several variables, limits and continuity, differentiation and its applications, theory of iterated and multiple integrals, introductory differential equations. Prerequisite: MA 122. Algebraic structures, including groups, rings and fields, with emphasis on writing proofs and including applications to computer science. Prerequisites: MA 122, MA 210 and MA 231. Transformational geometry, projective geometry and non-Euclidean geometry; a study of the nature of a logical system; applications to art and music. Student investigations guided by use of computer software. Prerequisite: MA 117 or consent of instructor. Hypothesis testing, multiple regression and correlation, two-way analysis of variance, multivariate statistics, nonparametric methods, sampling and simulation, quality control; applications to business and natural and social sciences. Students use computer software to analyze their data and interpret computer output. Prerequisite: MA 253. Statistical measures of central tendency and dispersion; basic probability; theory of discrete and continuous random variables; normal, binomial, Poisson, chi-square and t distributions; statistical inference; hypothesis testing; analysis of error; correlation and regression; analysis of variance; applications to business decisions and to experiments in nature and social sciences. Use of appropriate computer software. Prerequisites: MA 121 and MA 253. Discussion of readings and presentations by students on various topics in current mathematical literature, with particular emphasis on applications and mathematical models. Webinars or videos of presentations by professionals, attendance at a conference or several seminars, presentation at a conference if possible. Prerequisite: Junior standing as a mathematics major or minor. Logic and techniques of proof; sets and functions; the real number system as a complete ordered field. Convergence of sequences, limits and continuity of functions. Prerequisites: MA 210 and MA 322. MA 331 is recommended. The mathematics minor requires 18 credit hours of mathematics focused coursework. 18 credit hours required. Must take 15 credit hours of electives. Can choose from any MA course excluding MA 101, 105, 133 or 461. Mathematics teaching is a satisfying career. To be certified for senior high, junior high and middle school requires the math major and classes from the education department. A mathematics minor with an elementary education major is another excellent choice.